NEP Europe is to standardise on the new Grass Valley LDX 86N for Ultra HD production, with an initial shipment going in to five new OB trucks, one of which is likely to be Europe’s largest. “We have made an agreement to purchase Grass Valley’s new native 4K camera, because we see 4K is starting to develop in Europe, and now is the time to stop buying normal HD cameras,” said Paul Henriksen, President, NEP Broadcast Services Europe. NEP Europe has recently signed two agreements to facilitate UHD production in Germany and Switzerland. Deutsche Telekom will produce one match in each round of German hockey in UHD (with two or three rounds per week), using NEP’s latest 8-camera HD34K truck, which goes on air next week after being shown at IBC; while Swisscom Teleclub has been doing 50% of its coverage of Swiss football in UHD since July using NEP’s 16-camera UHD-41 truck. Both trucks have Grass Valley switchers and use the 2SI (two samples interleaved) format of UHD rather than quad HD. “We see that in the next six to 12 months we will need at least 40 4K cameras,” said Henriksen. These will add to the 12+ LDX 86 UHD cameras it already has. NEP Europe has bought Grass Valley cameras for years, and NEP globally has bought more than 600 in total. The LDX 86N uses new 2/3-inch XensiumHawk CMOS sensors with native 3840×2160 resolution, and use DPMUltra dynamic pixel management to also provide native 1920×1080 HD acquisition (by combining two horizontal and two vertical adjacent pixels inside the imager). The models being delivered to NEP will have all the options, and being both UHD and HD native Henriksen believes will making them ideal where both UHD and HD transmission is required. Although UHD production is rising rapidly, Henriksen doesn’t know when it will become the norm. “Our customers will decide.” However, he points out that it took from 2006, when NEP bought its first HD cameras, to 2012 for the industry to move to HD as standard. “What we have seen from having a proper test of the camera, the feedback we had from my technicians is that what [Grass Valley] has done with its noise reduction is very impressive,” said Henriksen. NEP already has a lot of Sony UHD cameras in the UK, but that is a separate NEP business. “We have also worked very closely with Grass Valley for the last six months on the switcher side,” added Henriksen. NEP as a group is also using Belden cable worldwide (Grass Valley is part of Belden). NEP is also making its first moves into IP production. “At NEP in the Netherlands it is already using the LDX 86 in an IP environment, and the cameras are upgradeable to IP,” said Marcel Koutstaal, SVP and general manager of the camera product group, Grass Valley. NEP Netherlands has also committed to the LDX 86N. “We have a very strong IP roadmap,” he added. “We’ve done a huge project in Norway where we’ve built a centralised production centre with Grass Valley from 12 race tracks across the country working as remote productions, with 36 cameras in full IP control to the racetracks,” said Henriksen. 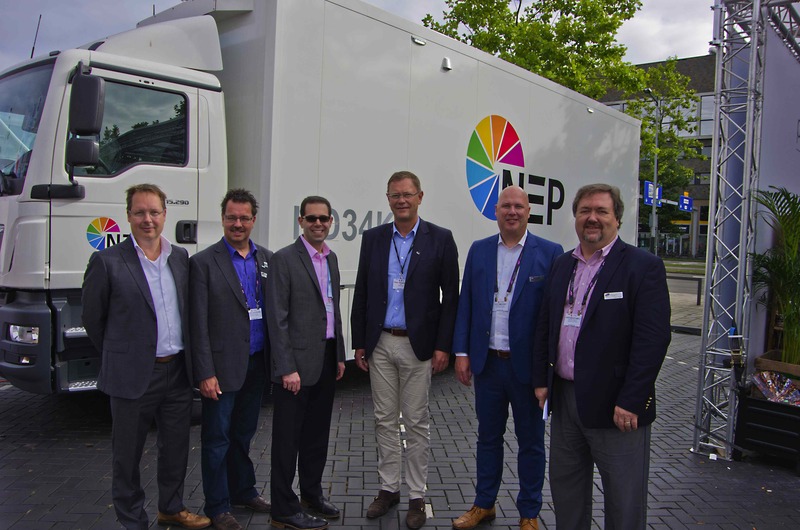 NEP Europe will take delivery of the first cameras by the end of the year and will be building five new UHD trucks, with Grass Valley switchers, over the next seven months. These will be built by Broadcast Solutions (which has built 23 trucks for NEP over the last five years). Four will be 10-16 camera vehicles, while the fifth will be a triple-expanding trailer capable of handling more than 30 cameras – “similar to what we have built in the UK,” said Henriksen. The four smaller trucks will be based on Broadcast Solutions’ Streamline concept. The exact mix has yet to be decided, but they will either be based on the S8, as used for HD34K, or the S12, used for UHD-41. The design of the largest truck is still being worked on. Work will start on the trucks in the next few weeks, and Breder is confident that all will be delivered within seven months — HD34K only took three months between order and delivery.